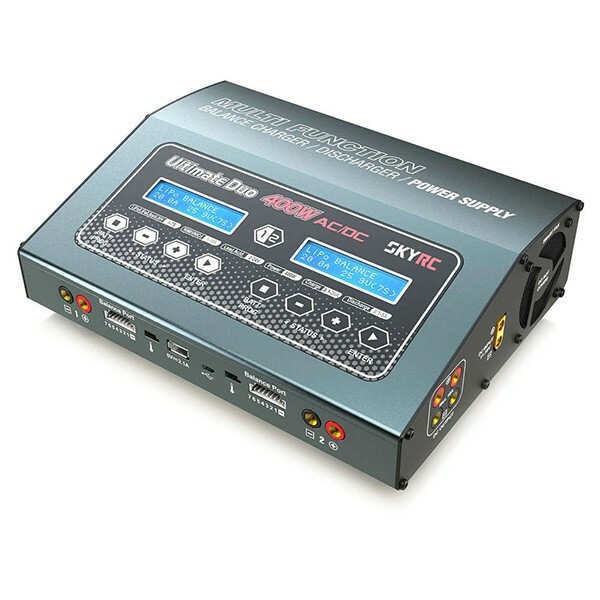 SKYRC D400 is a twin-channel charger with two independent circuits which can charge two different kinds of batteries simultaneously. It also supports power distribution in AC mode to get max charging power to shorten charging time. The total power for Channel 1 and Channel 2 is 400W. For example, you can set channel 1 as 300W, the channel 2 will be 100W. Your Ultimate Duo 400W can supply 150 Watts DC Power on channel 2. You can use it to power equipments that require DC power. It converts standard household power 100-240V AC to 6-15V DC power. Please note that you can use channel 2 only as charger or as power supply, not both functions simultaneously. Lithium Battery Meter and Battery Internal Resistance Meter. SKYRC D400 is a high-performance, micro processor control charge/ discharge station with battery management suitable for use with all current battery types, with integrated equalizer for seven-cell Lithium-Polymer (LiPo), Lithium iron phosphate (LiFe) and Lithium-Ion (LiIon) batteries, maximum 20A charge current and maximum 5A discharge current. 20 battery memories (10 each channel) are available which users could perform synchronous settings for charging same batteries simultaneously to offer time-saving benefits. The additional LiHV mode is able to charge the new generation of LiPo batteries with an end of charge voltage 4.35V.